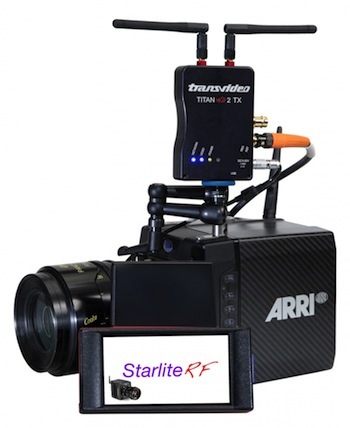 Following	the incredible success of the StarliteHD5-Arri, Transvideo presents	the StarliteRF-a. It's the unique 5'' touch-screen monitor-recorder	with a built-in wireless receiver specially adapted to control the	key functions of the new ARRI Alexa Mini and ARRI Amira. Free	of cables, lightweight and with all the reliability, accuracy and	fine engineering that Transvideo build into their products, it is	the perfect choice for Directors, Directors Assistants, Focus	Pullers and DOPs. This	update requires the V.150 installed. Firmware V2.00 includes record features and other new	functionalities. Register your product and donwload the update at www.transvideo.eu/support-stargate. Please read update requirements before processing. Package includes a U-Shape Holder. Products were used for a demo of	few hours. All units are duly tested and covered by 1 year	warranty. Warranty can be extended to 2 years by registering the	products on www.transvideo.eu/register-my-product	within the first three months of purchase. Send	an email at sales@transvideo.eu for more information. Thank	you Transvideo for making tools that I can count on. Merci! Jens. I've	been using Transvideo Products since the mid 90's. First as a	camera assistant and focus puller and now as Camera and Steadicam	operator. They have accompanied me on many shows, documetaries and	commercials. The LCD monitors, Transmitters and Receivers, all made	by Transvideo have performed flawlessly under the most demanding	conditions. 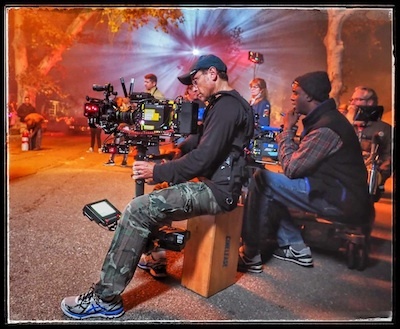 My	current monitors include the Stralite HD, the Rainbow HD and my	favorite the Cinemonitor HD6 XSBL, the workhorse for the Steadicam	community worldwide. There is not another monitor on the market	that meets the X-sbl in terms of features and manufacturing. Beginning with the unmachted 2000nits of brightness, the gyro	compensated level sensor, the host of image adjusment and	additional features. All	put together in a CNC machined housing with no fans or openings for	dust or moisture to enter. Truly well engineered and made in	France. This and the outstanding customer service that Transvideo	provides even years into the use of their equipment makes this	company special in my opinion. A major event in the digital media industry, Cabsat attracts every	year major players in the broadcast, satellite and digital media	sectors. Cabsat is the most important event in Middle East Area,	bringing together more than 15 000 visitors. The	NABShow is the largest international event dedicated to technologies,	equipment and solutions for electronic media, television, radio and	production. With over 95 000 visitors from more than 150 countries, it is the ultimate marketplace for entertainment and digital media.